Marrakech is one of those places that has probably always been a market town. Certainly I learned enough on this trip to know that it has for centuries been the metropolis of the Atlas Berber tribes and the place where they came to trade gold, ivory, leather and slaves, brought by caravan from across north Africa. The old-town, the walled Medina, is still much the same today. Choc full of stalls and souks, it feels as if you buy anything here as long as you are prepared to haggle. 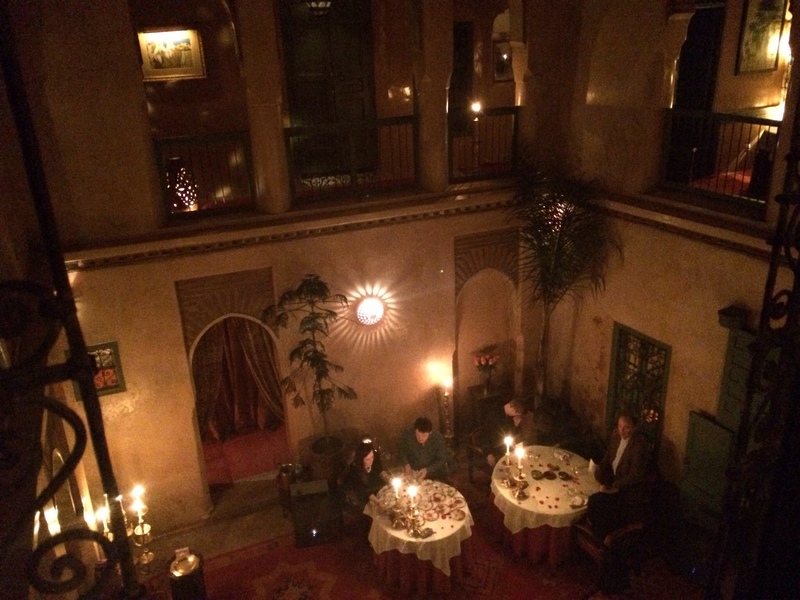 The only other thing I knew about Marrakech in advance of making the ridiculously roundabout trip here from Joburg on my way home to London, is that it is where the Rolling Stones infamously chose to hideaway from drug-bust troubles back in Blighty. The Rough Guide claims that Mick Jagger still visits to buy the occasional kaftan and the town certainly has a bit of rock ‘n’ roll chic about it. Most of all, this is place of music and food – the best of it outdoors every night in the bustling Jemmaa el Fna square, which is where I will start this travel guide. Jemmaa el Fna is the gateway to the Medina and is easily found my navigatin to the towering Koutoubia Minaret, which it faces across a life-in-your-hands road crossing. By day it is a place of crossings, plus the odd street performer and monkey show. At night, however, it comes alive with the incessant beat of ad-hoc live music shows, each drawing an audience of a few tens of people circling around a carpet, oil lamp and a kettle of mint tea. The bands we saw were mostly comprised of a single four-string guitar player, accompanied by a djemba drummer or two, a shifting cast of men playing a bender (a cross between a tambourine and a snare drum), accompanied by a crowd chorus. From a trip to the Berber Museum (see below) we learned that music is a big part of Moroccan culture, including the all-night ahouk ceremony, during which menfolk beat out an incessant rhythm on the bendir and drums, while women dance and sing. I’d like to get to one of those. Just wonderful! The Koutoubia Minaret dominates both the Marrakech skyline and, five times a day during the call to prayers, its airwaves. The Almohad tower is a really stunning piece of architecture and the aromatic orange garden to its immediate south provide a tranquil place from which to enjoy its artistry. In three full days only once did we feel the need to venture beyond the old town walls, but man alive* was it worth it. 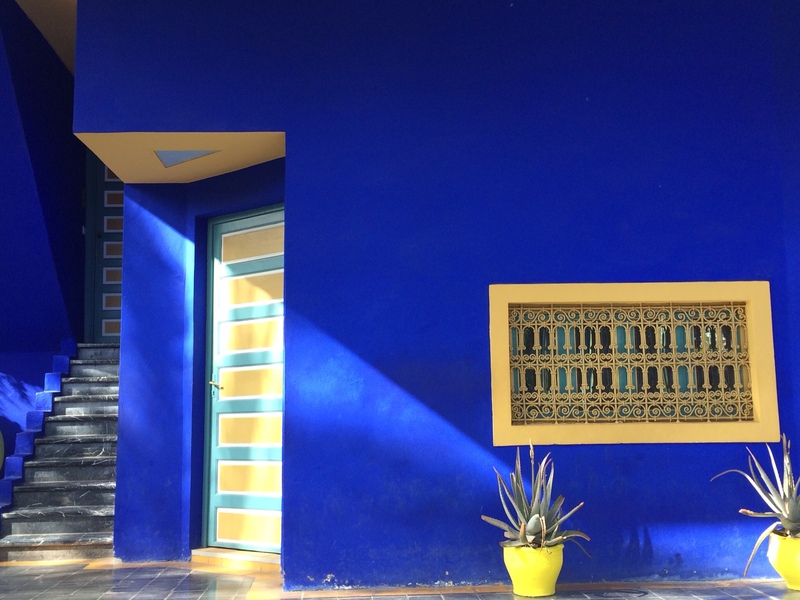 The Majorelle Garden was the 1920’s creation of the French painter, Jacques Morelle, but was comprehensively restored in the last twenty years by its second owner, designer Yves Saint Laurent. The Gardens themselves are a delight on a hot afternoon, providing twelve acres of cacti, exotic plants from across the world, a great cafe and haven of bird-song and shade amidst the tumult of Marrakech’s car-horns and traffic fumes. But the biggest treat is the Berber Museum. From the outside it is a sky blue treat which, fittingly, looks like it could only exist in French impressionist painting. Inside are displayed some of the most beautiful objects I have ever seen, courtesy of the extraordinary Berber mountain tribes. Everything is made with skill and artistry, from stunningly intricate jewelry of silver triangles, amber and beads, to more functional kaftans, sugar hammers, boots and even terra-cotta bee smokers, everything is a riot of colour and geometric patterns, which seem to be repetitive but which on closer examination are a series of unique motifs. In stark contrast to the slap-dash amateurism of the main ‘Museum of Marrkesh’, in the Berber Museum every exhibit has been beautifully designed and is evocatively housed, right through to the final case of musical instruments as you exit to the inevitable shop. It left me wanting to know much, much more about the Berbers, beyond the plain fact that this is people of the very highest culture. Constructed in the sixteenth century, the Saadian Tombs were intended to be both a resting place and a reminder of the glory of the eponymous sultan and his heirs. This plan worked for a couple of centuries, until the Aloudian’s sacked Marrakech and decided that while grave consecration would bring bad luck, it nevertheless wouldn’t do to allow a vanquished foe such a glorious landmark. The entrance to the tombs was thus bricked in and knowledge of their existence faded from memory, until the pesky French came along in their World War One flying machines. While it is nice to think that there are still a few hidden treasure troves left for Indiana Jones to discover, I’m glad this one is open for tourist inspection. Unlike the rather austere stone graveyards one finds in my homeland of Great Britain, Moroccan tombstone sing of celebrating a life passed. Each of the tens of slabs that adorns the site is a riot of geometric patterned colour, making this a place of beauty rather than spookiness. Get there early to avoid the tour buses. Monarchs like to declare their palaces to be ‘the greatest on earth’ and this one was no exception. Today it is a crumbling shell providing homes for a dozen storks, but you can still get a sense of the scale and the dungeons are well worth a wander. Buried in the heart of the souks, the Musee de Marrakech is housed in a magnificent late nineteenth century palace, which has recently been restored by a local philanthropist, whose photos adorn countless walls. The building itself is simply magnificent, with every wall a splendour of Moroccan mosaics, not to mention what must be the largest metal chandelier in the world. In contrast, the exhibits themselves are woeful, including possibly the worst collection of modern art I have ever paid to see. 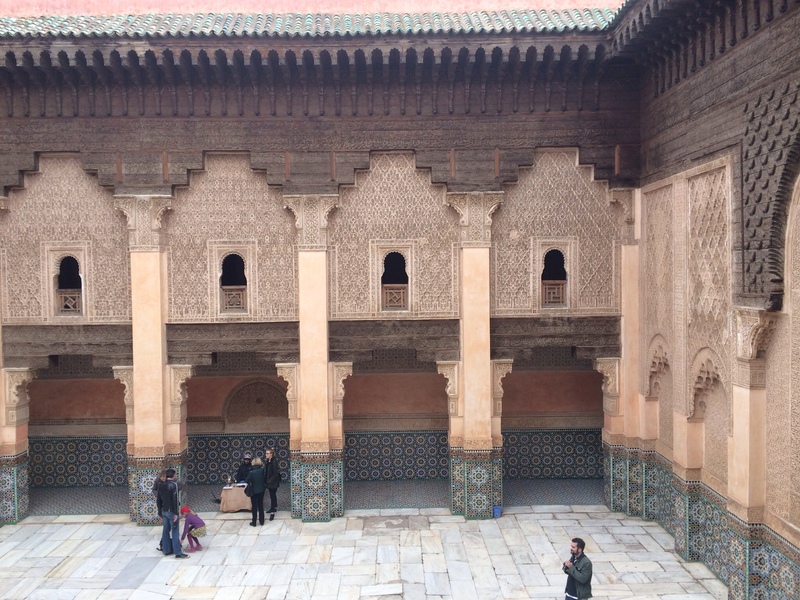 Situated next door to the Musee de Marrakech, the medersa was formerly a school for putative immams. It does austerity in spades and living here must have been like being in prison, albeit surrounded by exquisitely detailed architecture. Definitely worth a visit, but actually a bit depressing. Food is clearly a big deal in Marrakech, although choices are a bit limited if you are a vegetarian. Nevertheless, we found one restaurant that easily slips into my global top ten. Le Tobsil is hidden down a zig-zg alleyway just round the corner from Jemma el Fna, and there is no way we would have found it without the restaurant staff helpfully directing traffic in the main street a few blocks away on Derb Abdellah Ben Hessaien.